While global brands are often looked upon as faceless corporations, a lot of them are in fact run by local entrepreneurs. In the Czech Republic, franchising has boomed in recent years, helping smaller businesspeople to excel. It’s time to put a face to a name. In the burger business, McDonald’s founder Ray Kroc used to say, someone must have “ketchup in their veins” to succeed. Fifty years after its start – and now with more than 30,000 stores in 100 countries – McDonald’s still demands this. Although A GLOBAL mega-brand, the chain is actually one of the world’s largest franchise sytems, the secret behind its international reach. In the Czech Republic, for instance, there are currently 21 franchisees operating 42 shops, or some 60% of all locations. 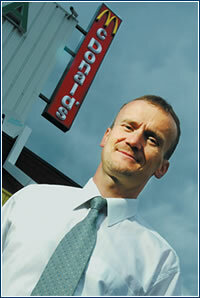 Petr Myška, who operates three McDonald’s here, compares franchisees to local entrepreneurs. “[McDonald’s] restaurants should be involved in the community,” he says, adding many promotions “reflect the tastes of the operator.” As an avid cyclist, Myška sponsors a bike race for neighborhood kids. Having a well-known brand and marketing support, Myška finds franchising to be a “comfortable form of entrepreneurship”. He likes the corporate assistance and the supply chain in place. “You can focus on what you need to do,” Myška says, mentioning some supplier horror stories he hears from other restaurant owners. Even with McDonald’s country sales topping CZK 2 billion, Myška is quick to point out that franchising is not a get-rich-quick scheme, but rather “a long-run business.” He adds: “In the end, it’s still quite a hard job.” Not a problem, though, for someone with ketchup in their veins. Currently, almost 100 franchise systems operate on the Czech market, according to information gathered by ČAF. Between 1999-2003 (when data was last put together by ČAF), the number of franchisees, or those who hold franchise licenses, grew more than five-fold to 752 from 143. In the same time, the number of franchise units, or shops and offices, mushroomed to 1,450 from 130. Impressive numbers indeed, but more interesting is the diversity of franchise operators today. Traditionally the domain of restaurants like McDonald’s, or retail names such as Yves Rocher, franchises can be found today in interior design, car leasing, or even real estate. Similar to any loan program, the scheme is unique in involving the franchisor in the process, as well as in taking into account the nature of the franchising, which KB’s parent, Société Générale, has experience with on the French market. “KB needs to understand the nature of franchising,” Léger points out, “since all parties – franchisor, franchisee and lender – have a stake in its success.” So far, results have been positive – the program now has dozens of clients. While most applaud KB’s work, others quietly grumble that there could still be much improvement in financing options for franchisees. Still, the majority agree it’s a step forward. “When a second bank starts [servicing franchisees], I hope that’ll be the start of a wave,” says FranKey’s Tamchyna. Tulpa agrees that options could be expanded. “Alternative sources like venture capital, business angels, leasing, and factoring definitely show slower development here than in other countries,” he points out. 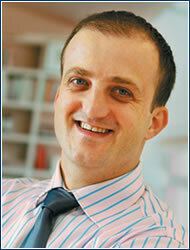 Another growth driver for franchising is its acceptance among Czech businesses. While originally foreign concepts dominated the market, today expansion among Czech concepts is higher than foreign ones. To Tulpa, this might be partly out of survival. “Competition has grown on the Czech market,” he says. “Consequently the quality of Czech franchise systems has had to improve.” Just as well, a number of Czech firms hope to use franchising as a competitive advantage abroad. “Czech franchise systems now consider expansion into EU countries, like Austria, Germany, Hungary and Poland, more often than before,” Tulpa notes, pointing to EU accession as a reason why. One example is Pietro Filipi (see sidebar, p. 20). While abandoning franchising plans on the domestic market, the Czech fashion manufacturer and retailer has used the concept to build a presence in three other countries. Joey Sheridan was no newcomer to the car business or franchising when he brought Hertz Lease to the Czech Republic one year ago. For 10 years he worked in the family business, Sheridan Motor Group – since 1915, one of Ireland’s largest and oldest motoring companies – and was a boardmember at Archer Sheridan, the subsidiary which operates Hertz Lease in Ireland and, now, here. Sheridan, son of Sheridan Group’s chairman, was tasked with expanding the company’s presence in eastern Europe – starting in Prague, where Hertz Lease was also seeking representation. 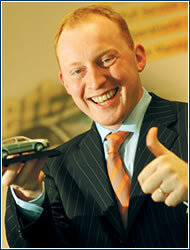 “Sheridan Motor Group has held the Hertz Lease franchisee for Ireland since 1985,” he says. “We saw an opportunity to develop our international business in a growing economy.” Starting the project in November 2003, the car leasing and fleet management firm opened for business near Ruzyně airport in September 2004, although this wasn’t as quick as anticipated. “Be prepared for the project to take twice as long and cost twice as much,” Sheridan advises potential franchisees. “[With Hertz Lease] there is a substantial upfront fee and periodic payments depending on the level of sales.” The Irishman says the high cost of acquiring the franchise can be a disadvantage in a competitive market, like the Czech Republic, but it’s a bet worth taking. “You should experience faster growth as the market will be, in some way, familiar with your name,” he says. After building a domestic franchise network of seven shops, Pietro Filipi changed strategy and bought back the Czech franchises two years ago. As both a fashion producer and retailer, the brand needed a better way to manage its stock levels. “It’s hard to solve through a franchise system,” says Aleš Pitro, chief project manager at Pietro Filipi. Currently, about 20% of production is sold through franchises. “We hope to double this number within the next 12 months,” confides Pitro. To do this, Pietro Filipi is looking east: from the southeast up to the Baltics and Russia. Pitro says the firm searches out potential franchisees through franchise associations, magazines and other representatives, but most often receives queries through the company website. “Finding a partner is the hardest part,” Pitro claims. Experience in fashion retail is helpful, he says, but one main requisite is somebody who has the capital, with investments amounting to between CZK 2-4 million depending on the location and its size (shops run between 150m2 and 250 m2). Typical franchisees are 30-something entrepreneurs, or often married couples, with some experience in retail. Once one shows interest, Pietro Filipi must approve the location, then it helps design and supply the shop decor, implement stock and sales control software, and hash out a business plan. “We try to help as much as possible,” Pitro says. “We know it’s not easy to establish a new shop.” From there, franchisees are in contact with the central office through weekly sales reports and monthly (or tri-monthly in Russia) visits by company representatives. Franchisees also visit Prague with the launch of new collections and typically buy 60-70% of the selection for their home markets – another benefit of using local entrepreneurs to expand, according to Pitro. “Franchisees definitely have a better knowledge of the local market,” he says. The first Czech franchisee of Segafredo opened an affiliate on Na Příkopě street in 1994. Today this 22-year-old concern has eight partners in the Czech Republic who operate 15 franchises and sell 1.2 million cups of espresso a year.Although Czech franchises account for only about 5% of the concern’s total sales in this country, the licensed cafés fall under Segafredo’s pivotal activities. Great demands are placed on the franchisees, as besides their own café operation experience they must have suitable space at their disposal as well as the initial investment – about EUR 50,000. The license itself costs EUR 20,000, and in addition the franchisees pay 4% of their sales or EUR 5 / per m2 a month to the parent company. “Expenditures are high, especially at first,” says Jitka Šmerdová, the owner of the Segafredo café that opened on Malostranské náměstí in May last year. In spite of this, and a general lack of management freedom, she says that doing business under the aegis of a well-known brand pays off. “Customers see the characteristic colors and are drawn in, because they can imagine the high-quality products and service,” notes the franchisee, adding that she’s planning on opening another Segafredo franchise on Old Town Square. However, Segafredo managers aren’t merely supervisors and fee collectors. They offer their partners extensive service, such as advice on choosing locations and an operational concept. “We rent them espresso machines and other equipment for preparing coffee, and branded chinaware. 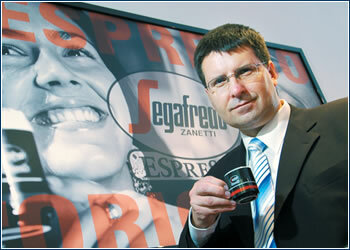 We produce the Nero espresso especially for the franchisees,” says Jaromír Bosák, director of Segafredo Zanetti’s Czech headquarters. New partners go through basic training relating to the provision of services and the technological procedures for preparing Italian coffee. In the autumn Segafredo will open a bartending school in the Czech Republic, where, among other things, students will gain a working knowledge about coffee. A poster with a red, white and blue hot-air balloon caught Vojtěch Krátký’s eye when he was on a trip in Germany. 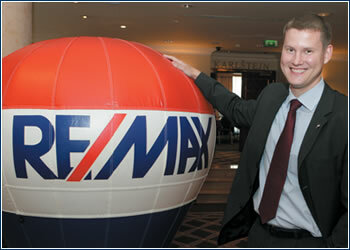 It was the logo of the kingpin of American real estate agencies, RE/MAX. RE/max IS the world’s largest seller of real estate, with 5,700 international offices. Its logo, familiar in western Europe, is instantly recognizable in the US and Canada as well, where it rose solidly to number one. A property listing in one city means worldwide access via the company’s website. 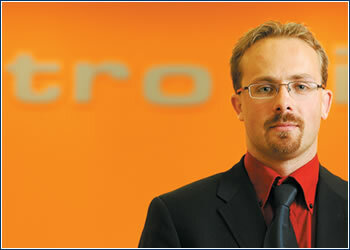 Krátký bought a master franchise for the Czech Republic, and since April has been leading a team of 12 in the country’s first office, in modern premises in Karlín. Krátký’s concerns with the local residential market were solved as a franchiser. With RE/MAX he claims he can offer much more. “A strong brand with a great reputation, strict ethical code, after-sales service, and a centralized system of complaints,” says Krátký, listing some advantages. Compulsory training in the US gave the franchiser the necessary expertise, and made the extent of company support evident. “The most important aspect for me is the system of continuous assistance, which responds to franchisee’s real needs in real time,” he says. There is considerable flexibility – franchisees can open a prestigious address or work from home. As such, initial investment is hard to quantify, but Krátký says it is possible to open an office including a franchise fee for slightly more than CZK 500,000. “You have a significantly higher chance to succeed compared to doing a business yourself. Among other things, you don’t have to repeat mistakes that someone else has already made,” notes Krátký. It only took a visit to a franchising exhibition to convince Nenad Tutumovic to bring the interior design brand KA International to Prague. WITH MORE THAN 480 SHOPS in 43 countries, the Spanish company KA was obviously a tested concept. So after contacting an investor, who also knew a few things about interior design, the two partners initiated business. They spent the rest of the year researching the Prague market and visiting with one of the newest KA franchisees in Hungary before meeting company officials again at the beginning of 2005. From then, it was another three months of securing a space, making the necessary renovations to it, designing the layout, and training staff before opening in July. The final two aspects above are where the advantages of franchising come into play. “The head office was very involved,” recalls Tutumovic. The pair got help with the shop design and product placement, as well as on- and off-site training in Madrid. Prior to the opening, two company representatives were on hand for last minute details. Even today, the two say assistance is only a phone call away. “We feel like we are in a partnership [with KA],” Tutumovic says, praising KA’s quick communication in pricing or customer relations.